This essay by senior writing major Lani Prunés pertains to an experience she had while on her EMU cross-cultural in the spring of 2013. Lani is a native of Philadelphia, where she is active in Oxford Circle Mennonite Church. All along, Colombia’s leading politicians have told the leaders of displaced peoples in rural regions to be quiet about their struggle to survive. Last April, the governor of the Bolivar region, Juan Carlos Gossain, asked the Montes de María communities not to march for the beliefs they carry alongside them every day, not to lay down their tools for a week for the sake of the land they love. I arrived at the gathering of Montes de María campesinos, with another undergraduate from EMU and “Seeders” from Mennonite Central Committee, all of us desiring to support this quest for social justice. As I slipped from the back of the tiny motorcycle that had brought me to the bottom of this mountain through the rain and mud, the first thing I saw were small mounds of supplies and tall signs. The signs said things like “Por la reperacion integral” and “La Montaña se mueve,” or “For integral reparations,” and “The mountain moves.” The small mounds consisted of cloth bags of yucca and ñame and piles of firewood, necessary to feed the protesters. The area was alive; groups of people discussing the plans, announcements made through a loudspeaker hidden among the crowd. Droves of motorcycles dropped people off, adding to the ever-constant stream of people and provisions. Trucks weighed down with families rushed down the mountain, the people aboard scattering to learn news or set up hammocks nearby. Over 700 people gathered at Arroyo de Arena, most campesinos, farmers originally from the Montes de María, a community of hundreds of families. Decades ago, inhabitants of those communities fled their homes for fear of their lives, caught between warring militias and government-backed soldiers. Their return to their land was fraught with challenges: confusion over land titles, lack of medical care and schools, and general unemployment. On top of that, a relentless fungus has decimated what was a major source of income, their avocado crops – without government assistance, farmers cannot revive this major cash crop. The five-day plan? Walk 70 miles, from where we met to Cartagena, where community leaders planned to meet with government officials in the hope of winning an agreement for better support for the Montes de María communities. And walk we did on that first day, from 6 a.m. to 4 p.m. in the blazing Colombian sun. People sang to accordionists and shared snacks of cheese bread and made sure water got around to everyone. Determination seeped from every pore and touched every community we walked through, flags and signs waving high, cheers and chants breaking the rural calm. However, the plan changed once the governor of Bolivar sent delegates to assure us that he wanted to talk, and that he would even come to us at our resting point in San Jacinto at the end of the first day. When Gossaín arrived, he spoke for well over an hour, assuring the crowd of how much he cared about each of their communities, but that walking the entire way would be a waste. If everyone could talk here, why walk for another four days? Meanwhile, we gringas meandered around the San Jacinto school, wondering where to stay overnight, while exploring and speaking to the children, who were not shy about expressing their opinions and asking questions. We watched the groups of cooks make meals for the entire group out of the collected and shared food, and were stared at curiously by the volunteers providing security at the schoolyard entrance, placed there so people from the nearby community would not come in and eat the food or stir up trouble. Eventually, some people came forward and asked us where we were from. We explained that we were in solidarity with their cause and were there to help in any way we could. The group extended warm hospitality to us, inviting us to accordion battles and romantic ballads, and giving us bigger portions of yucca and beef and rice. At night, hundreds of people set up a web of hammocks in the nearby forest, and we did likewise. 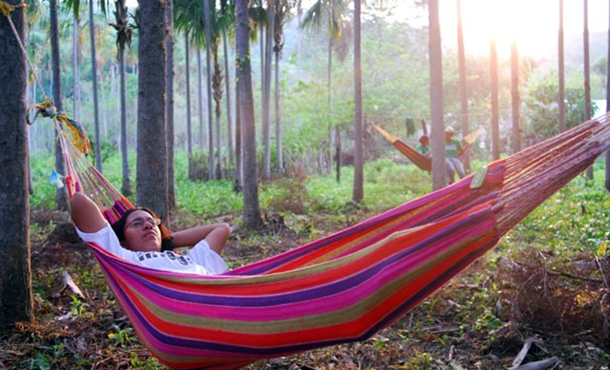 The people around us saw our dreadful attempts at tying hammocks, commented loudly that we would never sleep well hanging like that, and retied them for us, every time. They stared at our cross-cultural reading material, tried sneakily listening in as we answered questions in clumsy Spanish about American culture, and showed us pictures of their relatives in the States. Around us, discussions were being held with the heads of various government agencies. Some governmental leaders blamed farmers for their dead avocado crops. Assurances were made for a health clinic on one side of the mountain. 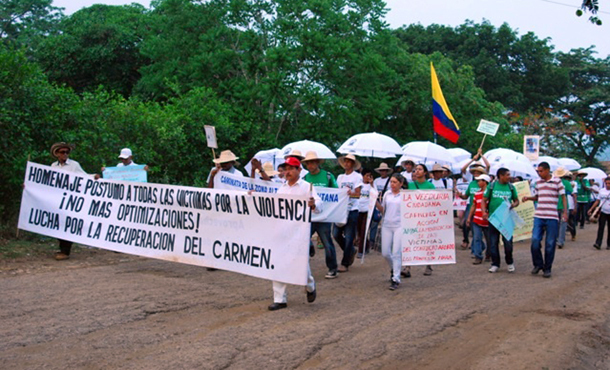 The Montes de María leaders insisted their people were prepared to continue walking as planned if their demands were not met. Gossaín made a bold announcement that the local government was already working on many of their demands, and that the president himself would come talk to them in a month to settle on the issues. Given such a promise, the leaders then decided there was no point in continuing the protest, so the hammocks were taken down, the pots cleaned and stacked, and the groups assembled. A sense of triumph filled the air as people boarded air-conditioned buses supplied by the governor after the leaders demanded them. 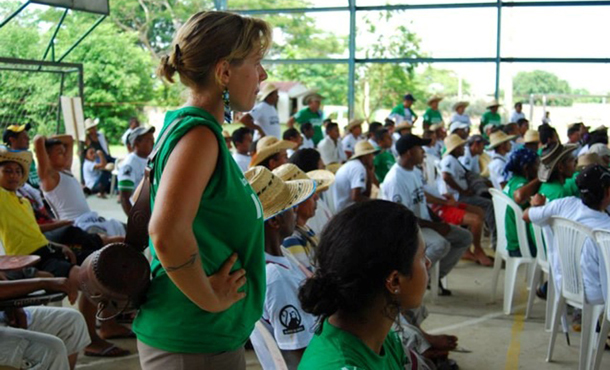 Sadly, as of mid-September 2013 – five months after the suspended march – the demands and needs of displaced communities still are not being met in Colombia, according to the organization Sembrandopaz. (This organization was founded by Ricardo Esquivia in 2005 to support justice and peacebuilding in Montes de María and the Caribbean region of Colombia.) Campesinos are currently striking, directly affecting the country’s economy, because the government has ignored their cries. Movement leaders from the Montes de María have been thrown in a high security prison or accused of being guerrilla leaders in order to scatter blame where it is not deserved. I have no doubt that through their current strife, Colombia will see a day where the belittled and forgotten will be respected and regarded as crucial by not only its government, but by its people. This faith lives on within those who remember that Colombia thrives on the labor and resilience of the campesinos, that those communities have bonds that cannot be broken with prison walls and death threats, and that after the bad times – after the rain and the mud and the suffering – must come a time of peace and equality, from the coastal fisherman to the mountain farmer, and all the advocates in between. 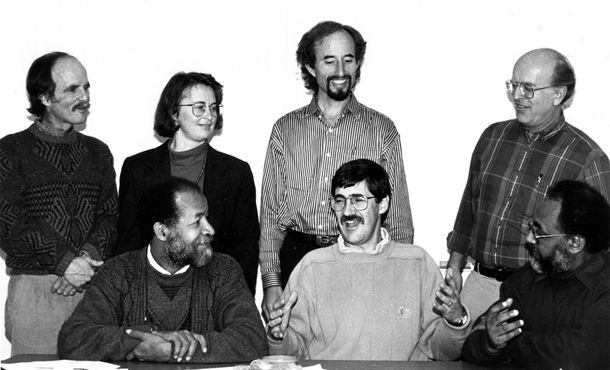 Renowned Colombian peace activist Ricardo Esquivia is seated at left, beside John Paul Lederach, at a “strategic planning” meeting in 1995 to discuss the work of the fledgling Conflict Transformation Program at EMU, now known as the Center for Justice and Peacebuilding. Editor’s note: Long-time peace activist Ricardo Esquivia is at great risk in Colombia at the present time. In an alert emailed Sept. 18, 2013, Jess Hunter-Bowman of Witness for Peace (led by EMU alum Sharon Hostetler ’80) said that following Esquivia’s involvement in the Montes de María community movement, the military has arrested one of his fellow leaders and likely also will be arresting Esquivia on concocted charges of being a guerrilla leader. For more information, visit the Witness for Peace website.